A look at an unreleased colorway of the SB Zoom Stefan Janoski, originally set to release this month. 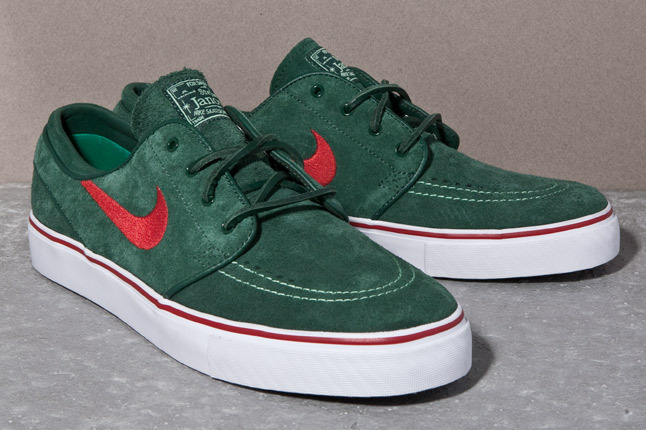 As many of you may know, there is already a green based pair of the SB Zoom Stefan Janoski releasing this month. However, this festive green and red pair was originally set to release for the holiday season. Similar to the released pair, this unreleased sample adds in a bit of red to create more of a holiday season feel. Festive green is seen taking place on the complete suede upper,along with leather laces and leather lining also covered in festive green. Setting this sample apart from the released pair, a red Swoosh is added, along with a red foxing stripe taking place on the white vulcanized sole below. Which pair would you prefer? is an all green look better, or would this unreleased sample be better suited for this holiday season? Let us know!